Hotel Crescent Court is situated within Dallas's Crescent complex, home to upscale shopping and fine dining. The property's European-style facade conceals sleek, contemporary interiors. French doors connect each room and suite to its wrought-iron balcony; accommodations feature impressive views of the pool or garden courtyards. The enormous property, which encompasses an entire city block, also houses the 23,000-square-foot (2,137 square meters) Spa at The Crescent. The Spa Cafe offers a menu of health-conscious fare for breakfast and lunch. Business travelers will appreciate the property's close proximity to the business district as well as its complimentary sedan service serving any destination within a five-mile radius. Corporate groups can take advantage of state-of-the art executive-conference spaces and a boardroom. For wedding parties, the hotel offers 14 luxuriously appointed salons as well as bride's and groom's special packages including spa treatments. Devotees of the luxury lifestyle will enjoy visiting on-property stores and eating at the hotel's Nobu restaurant. Within its quietly opulent 22,000-square-foot Dallas spa facility, The Spa at The Crescent offers one-of-a-kind treatments and services for men and women in 16 state-of-the-art treatment rooms. Luxurious product lines and knowledgeable service combine to create one of the best spas in Dallas. This award-winning facility offers guests a proven regimen for total body health. Guests also enjoy meticulously maintained locker rooms with amenities, fluffy towels and personal grooming supplies. From massages to hydrotherapy and confidence-lifting facials and mani-pedis, the 16 state-of-the-art treatment rooms comprise an advanced spa setting that rivals any in the world. The Crescent, home of the Hotel Crescent Court, is a multipurpose business complex with a distinctive Indiana-limestone facade. In addition to the hotel, spa, and fitness center, the complex houses a Stanley Korshak store, coffee shops, and several fine restaurants. Dallas's fashionable Uptown neighborhood is known for its high-rise homes and cultural activities. Hotel guests are a short drive away from the Dallas Museum of Art, home to more than 20,000 works ranging from contemporary American video installations to ancient Egyptian sculptures. Adjacent to the museum is the Nasher Sculpture Garden featuring both indoor and outdoor displays. The city's 17-block Arts District encompasses several smaller museums and galleries, a concert hall, and an open-air performance park with two stages. The American Airlines Center, the site for Dallas Mavericks (NBA) and Dallas Stars (NHL) home games (as well as pop concerts), is just 1.5 miles from the hotel. Hotel Crescent Court patrons can get around easily, even without a car. The free M-Line trolley stops just outside the complex on its route through the district. The hotel also offers a complimentary sedan service for guests who want to visit any destination within a five-mile radius. Hotel Crescent Court offers 220 rooms and suites. Rooms range in size from 350 square feet (33 square meters) to 625 square feet (58 square meters). Each includes a small wrought-iron balcony accessible through French doors; north-facing rooms feature views of the Crescent Complex's garden courtyard. The hotel's extra-spacious suites come with additional amenities such as private kitchens, dining rooms, hardwood floors, and original artwork. Spiral staircases add whimsy to some duplex suites. A dinner-only outpost of Nobu, the famous nouveau-Japanese restaurant, is open nightly on the hotel's ground floor. Guests can dine a la carte, enjoy creative sushi options, or order from the prix fixe tasting menu. Desserts merge Continental concepts and Asian tastes, resulting in tantalizing hybrids such as green tea crème brûlée. 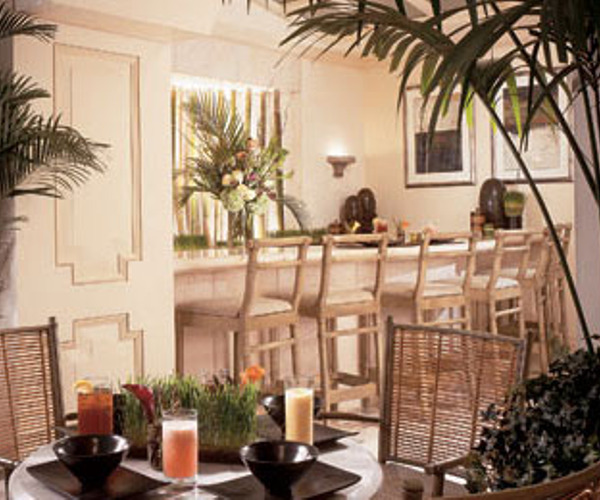 Located just outside Nobu's entrance in the hotel lobby is beau's, a relaxing lounge serving breakfast, lunch, cocktails, and tea on the weekends. The light, lively fare includes Zen blackened tuna salad dressed with chile-lime vinaigrette, grilled corn and smoked chicken soup, and chocolate mousse cake in mango sauce. A tapas menu is available at the bar nightly. An alternative breakfast and brunch locale is The Conservatory, a glass-enclosed intimate space overlooking the gardens. Among its signature dishes is the wild mushroom and leek tart surrounded by herb salad with red-wine vinaigrette. A beverage and snack bar featuring Starbucks coffee can be found by the main entrance to the hotel.